Tiger Woods tees off on the 18th hole during the first round of the Valspar Championship golf tournament on March 8, 2018, in Palm Harbor, Florida. Tiger Woods will not play in this year's tournament. 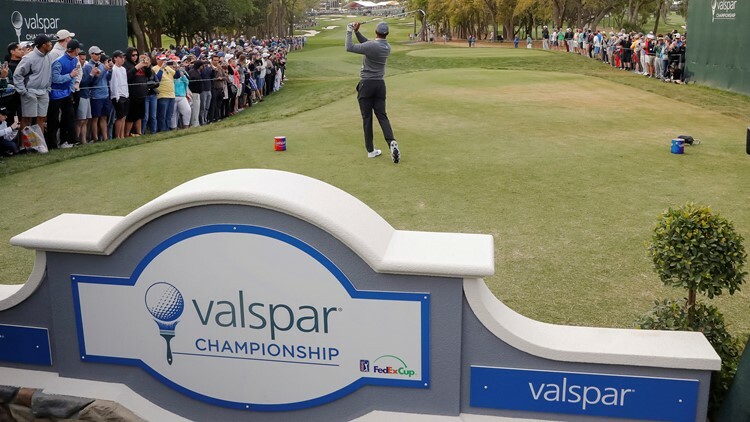 PALM HARBOR, Fla. — The Valspar Championship is this weekend at Copperhead Course at the Innisbrook Golf Resort in Palm Harbor. The 18th annual tournament – which has gone by other names in the past – runs from Thursday through Sunday. The winner of the tournament is set to earn $6.7 million. Children ages 15 years and younger are free with a ticketed adult. Parking is available if purchased in advance, but organizers are encouraging attendees to use ride-sharing services like Uber or Lyft to get to the course at 36750 U.S. 19 North in Palm Harbor. Tiger Woods will not play in this year’s tournament. Dustin Johnson, who is the top-ranked player in the world, has committed to playing this year. Click or tap here to see which other golfers are playing in this year’s tournament. The Golf Channel’s television coverage goes from 2-6 p.m. ET Thursday and Friday, and from 1-3 p.m. ET Saturday and Sunday. NBC will broadcast the rest of Sunday’s coverage from 3-6 p.m. ET.